As little kids in pajamas, high on peanut butter and jelly, glued to the TV set, we were big fans of the Jetson’s. A cartoon series that depicted a hella good life in our future. What we remember most was the technology that was in store for us. Snacks were available at the touch of a button. A house in the clouds with a great view from our bedroom window. The best part of all was dreaming about being flown to school everyday in our family “Volocopter”. That time is long gone. However, the possibility is still in our imminent future and riding in flying cars is a promising reality for us. 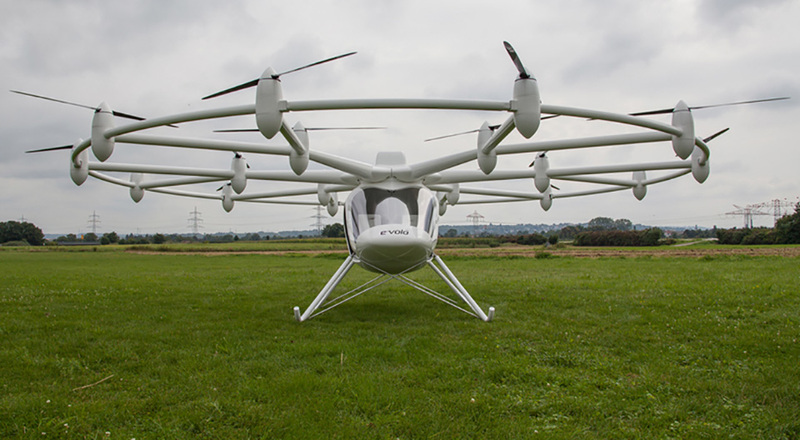 The E-Volo Electric Helicopter has achieved flight, the first of its kind to sustain lift from electric power. Designed to carry two people, the VC200 is a vertical take-off and landing aircraft that requires no mechanical pitch control of the propellers and is claimed to be safer, simpler, and cleaner than normal helicopters. Ladies and Gentleman, meet the new ride. The maiden flight and first test flights were conducted in the dm-arena in Karlsruhe with the prototype of the 2-person VC200 on Sunday, November 17, 2013. Based on this model, it will be prepared for series production in the coming years. 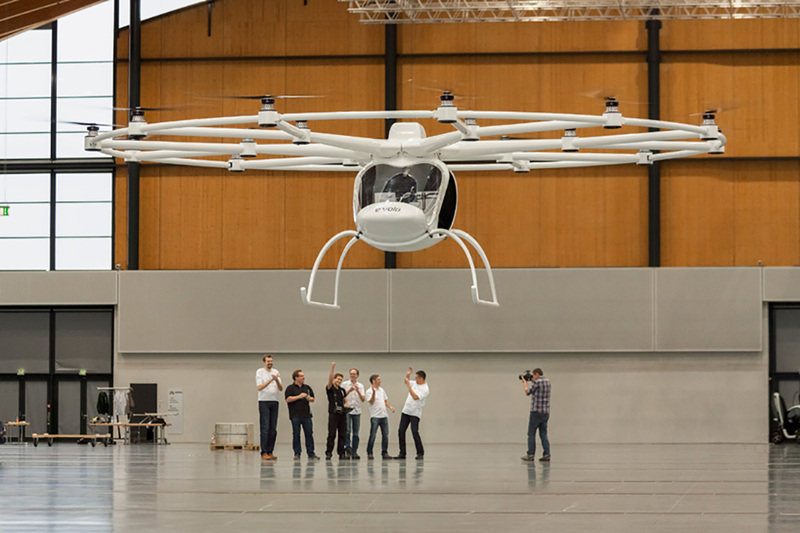 “There are already numerous requests for the Volocopter from around the world,“ said Alexander Zosel, managing director of e-volo.The developing team of e-volo knew from the onset that the Volocopter was very easy to fly. Due to elaborate simulations at the Stuttgart University, they already knew that it was much more quiet than a helicopter. However, the pleasant low, rich sound and the lower-than-expected noise level caused great cheering among the e-volo team during the first flights. Nearly all problems of normal helicopters are thereby solved. 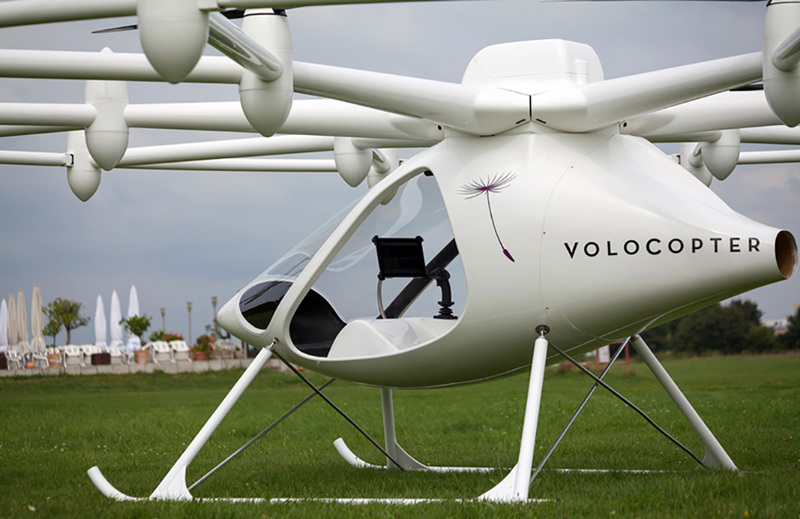 The safety of the volocopter is the redundancy of its components. All safety relevant systems are present in multiple number.Thereby the volocopter is safe to fly even if several drive units fail. Even if the range extender fails, a safe landing is ensured by additional batteries.Volocopters are fitted with a rescue system in the form of a parachute which safely lets the entire aircraft sink to the ground in the case of an emergency.